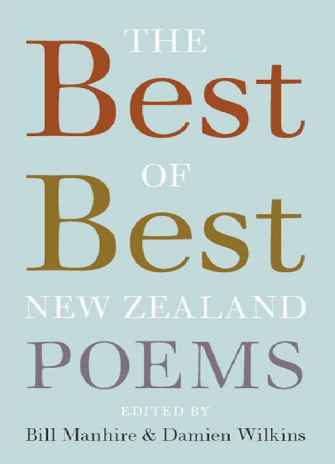 The Best of Best New Zealand Poems, edited by Bill Manhire and Damien Wilkins (Victoria University Press, 2010) 224 pp., $35.00; These I Have Loved – My Favourite New Zealand Poems, edited by Harvey McQueen (Steele Roberts, 2010) 192 pp., $34.99. Because you are reading this, you are part of the electronic revolution. These words exist only in cyber-space. Paper has nothing to do with them. And for the last twenty years or so, clever people have been telling us that this is the way ahead. Websites, blogs, on-line journals etc. are going to take the place of those physical objects, books. Printed books will go the way of the hand-written codex. A few reactionary ‘craft’ printers might still produce them as a kind of folk-hobby, but the rest of us will be Kindling and reading off screen rather than off page. So isn’t it funny that when an on-line journal reaches its tenth year of successful production, it celebrates by producing a real physical book with real physical pages? The Best of Best New Zealand Poems gathers together what Bill Manhire and Damien Wilkins consider to be the cream of Victoria University’s online poetry journal Best New Zealand Poems, which began in 2001. The journal has had a different editor each year, from Iain Sharp in 2001 to Chris Price in 2010, so initial selection of contents is not tied to one person’s idiosyncratic taste. In his introductory essay, Damien Wilkins’ tone is a little defensive about producing a book to celebrate something online. He is determined to pre-empt this obvious criticism, as well as some others. There is, as he correctly notes, an element of hubris in calling a personal selection of contents ‘the Best’. He points out that of the 65 poets represented, there are 38 women and 27 men, so the two blokes who selected the contents haven’t been sexist or anything. He also writes: ‘One final piece of accounting – and this will inflame some readers. By my estimate more than 30 per cent of the poets in this book have connections to either the International Institute of Modern Letters or Bill [Manhire]’s old Original Composition class. What can we say?… these are the poems that most excited us.’ I’m not sure that it was prudent to say this. Whatever Wilkins’ intention, it inevitably creates the impression of a clubby in-group. And so to the 65 poets, arranged in alphabetical order from Fleur Adcock to Ashleigh Young. I’m interested that it is women rather than men who tend to dwell on the rough stuff (Michele Amas’ raw sexual concern for her daughter; Tusiata Avia’s celebration of a wild and crazy sexual encounter; Bernadette Hall worrying about war; Anne Kennedy watching the All Blacks’ vigorous tribal battle on the telly). Men and women are equally satirical (Hinemoana Baker’s surrealist protest poem; Gordon Challis defying regulations; Karlo Mila angry at fake stereotypes of Pasifika; Robert Sullivan doing his block about the government’s overriding of Maori customary right). Men and women are equally prone to strong feelings about parents and family (Rachel Bush in praise of old-time at-home Mums; Geoff Cochrane writing tenderly about his brother; Rhian Gallagher burying her father; Andrew Johnston’s long stately elegy for his father; Vivienne Plumb reflecting on her very sick son; Sonja Yelich worrying about the kind of education her kids are getting). Some poems are written loose blog-style (Jenny Bornholdt seeing a poet as a fitter turner; Stephanie de Montalk facing a bone-scan). By contrast, a few brave spirits go for more traditional structures and metres (the eight rhyming lines of Alistair Campbell; that radical young poet Allen Curnow translating Pushkin; John Gallas breaking into rhyme; Paula Green almost writing a Petrarchan sonnet; C.K. Stead replaying Allen Curnow’s loss of Christian faith). I could pick out those poets whose selection is dream-like or surrealist (Fleur Adcock), and those who are more social-realist (Peter Olds). But it is really impossible to make generalisations beyond the ones I’ve already made. And this one. New Zealand poetry is in good health. It produces a lot of interesting stuff. One quibble. At the back of the book are biographical notes on each contributor, and a statement from each poet on what the poem means or what inspired it. Some of these statements ramble on for longer than the poem being explained. The rebellious part of me kept wondering why the poems needed such crutches to lean on. Were they not capable of communicating what they had to say by their own text? High praise, then, to Sam Hunt and Gregory O’Brien for not playing the game and for providing no such explanation of their contributions. Harvey McQueen died late last year, at the age of seventy-six. He was a considerate teacher and anthologist, as well as a good poet in his own right. I had the pleasure of reviewing his last collection, Goya Rules, for Poetry New Zealand. I judged it sane, civilised and capable of making big statements about history without either embarrassment or mawkishness. The same statement can be made of the anthology These I Have Loved, the last thing McQueen produced before his death. 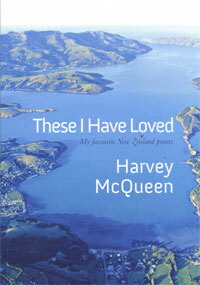 As the title (per Rupert Brooke) makes clear, in choosing his one hundred favourite New Zealand poems, McQueen was guided first by his heart, not by current critical fashion or consensus taste. He explains in his introduction that he was not deterred, either, by complaints that some of his choices might be considered hackneyed. So he includes Ruth Dallas’s ‘Milking at Dawn’, Denis Glover’s ‘The Magpies’, James K. Baxter’s ‘Lament for Barney Flanagan’, Allen Curnow’s ‘House and Land’ and Mary Stanley’s ‘The Wife Speaks’. And why not? They deserve to be on anybody’s list of the twenty best New Zealand poems ever, let along the hundred best. It doesn’t matter that they have been anthologised often before. From somebody who died at a reasonable old age, much of McQueen’s selection consists inevitably of earlier generations of poets. Mason, Baughan, Bethell, Glover, Curnow, Fairburn and Tuwhare are generously represented, and a whole section is devoted to Baxter, whom McQueen describes as: ‘bestriding my poetry life like a colossus’. But McQueen kept reading new poetry to the end, and These I Have Loved also comes up with goodly selections from newer breeds (Kate Camp, Jenny Bornholdt, Mark Pirie, Janet Charman) as well as a few surprising choices from poets who have published little. How do you judge somebody else’s selection of favourites? You don’t really. You sit back and take in the anthologist’s comment that: ‘to a considerable extent [the selected poems] represent who I am, or maybe the person I would hope to be.’ The anthology is organised thematically. Each section is introduced by a brief essay. Often the tone is autobiographical, as McQueen explains why and how he first encountered the selected poems. He knew his end was approaching as he anthologised. He writes: ‘I’ve been diagnosed as having a rare muscular degenerative disease with no known cure.’ This is a browsable and school-friendly anthology. Also a heck of an epitaph. – NO, IT’S CALLED BIAS. THE BEST NZ POEMS IS COMPLETELY BIASED TOWARDS THE IIML AND WELLINGTON WRITERS! IT’S A JOKE REALLY. THE IIML DOMINATES NZ LITERATURE IN AN UNHEALTHY WAY. .